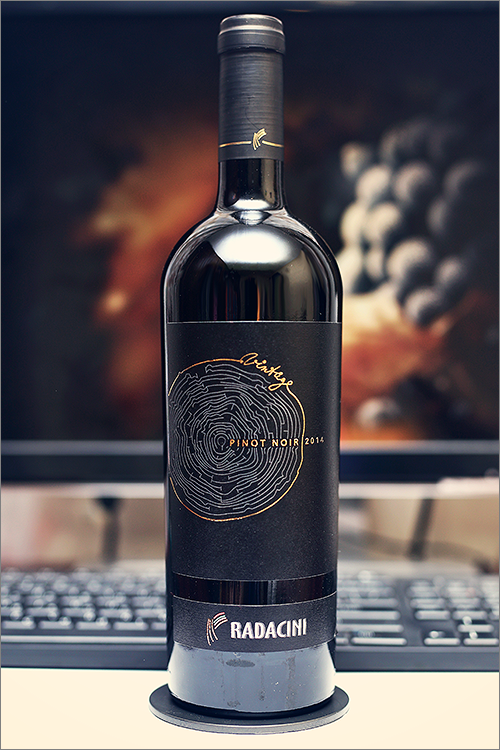 Today we are going to review another pinot noir wine, this time from Radacini: Vintage Pinot Noir 2014. Pinot noir is the most highly prized wine in the world, as the grape itself is weak, suffering from a variety of diseases and its genetics make it highly susceptible to mutation, but what makes pinot noir so desperately wanted, is the way it can preserve ‘terrior’, as it is capable of producing divinely scented, gorgeously fruity expressions of its place of growth. But let’s not get bored with too much theory, let’s move on to the tasting. Clear and transparent garnet color, with shades of indigo and purple towards the rim. The nose is rich, filled mostly with red and black fruit flavours: sour cherry, ripe blue plum, blackcurrant, blueberry, blackberry and some nuanced hints of cherry tree wood. An instant later comes secondary and tertiary notes of red and black pepper, cinnamon, black tea and some subtle hints of tomato leaf. The wine is dry, with high alcohol level, high acidity and rough tannin. It tastes bitter, seedy and quite spicy, with a quite bold body. This is an overoaked, woody and toasty wine, not what you’d expect from a classic pinot noir wine. The wine has a fair overall balance and a quite nuanced spicy accent. It has a medium finish and an astringent, a bit aggressive and sharp aftertaste. This is definitely a fair Wine of Moldova and the overall rating says the same, with 86.9 points scored it is right there, among the best wines we’ve tasted so far. Please click on the chart icon on the left in order to get to the wine rating page, where you can find all the wines we’ve tasted to date. Conclusion: this wine is clearly in its prime form with no more bottle ageing required, as it has a quite fair balance between all its elements. Its spicy-woody accents will pair amazingly well with any hot and spicy dishes, like for example a thai basil beef, as the tannins and acidity in the wine will cut nicely through the fattiness and sweetness in the dish, while the spicy accents will complement each over quite nicely. Enjoy and remember to drink Wine of Moldova.